The Springs Preserve offers ever-changing educational opportunities for teachers and students alike. With themes exploring all aspects of nature and science (and aligned with Nevada State Standards), our exhibits are interactive, engaging and fun! All teachers bringing students to tours at the Springs Preserve (whether guided or self-guided), must complete online "Teach the Teacher" training. Supplement your self-guided field trips by renting one of our "Know on the Go" backpacks for the day! Each one of these themed backpacks include artifacts, supplies for hands-on activities, lesson plans for your entire group, and more. 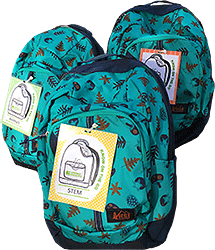 Backpacks are available in three themes—History, Animals, or STEM (Science, Technology, Engineering and Mathematics)—for $10 each. Please contact Springs Preserve Education at 702-822-7729 or email us to reserve a backpack. If you're not looking for the in-depth lessons that go with our Guided tours, but would still like your students to explore more of what the Springs Preserve has to offer, you can sign up for our Butterfly Habitat Bonus Experience, available seasonally for $2 per student. Bonus experiences must be booked online in advance along with your school tour reservation, and may be subject to limitations. One single payment for all students will be due one week in advance of your tour date. Looking for something a little more in-depth? Guided tours offer a premium experience for your students. These tours are led by Springs Preserve staff and provide a behind-the-scenes look at the operations of the Preserve. Guided tours are currently sold out for the 2018-2019 school year, but are otherwise available Monday-Friday from 10 a.m. to noon, with one hour for the Premium experience, and one additional hour to explore the Springs Preserve. Guided tours cost $50-$75 per class. Each theme is aligned to the learning standards of a particular grade, but teachers are not required to sign their students up for their grade's corresponding topic. Payment is due one week in advance of the guided tour date. Meet the Mojave (Preschool) $50 - Half-hour tour. Mini Zoology (Kindergarten) $50 - Half-hour tour. Includes a behind-the-scenes tour of our animal care area. Zoology (1st Grade) $75 - Includes a behind-the-scenes tour of our animal care area. Butterflies (2nd Grade) $75 - Available seasonally. Includes tour of the Butterfly Habitat. Once you've read all of the information on this page and have decided what type of tour you'd like to take your students on, please click the button below to complete a school tour request form. If you have any questions about school tours, please call Springs Preserve Education at 702-822-7729. We've developed these specialized activities for teachers to complete with their students around the Springs Preserve. All teachers bringing students on tours of the Springs Preserve (whether guided or self-guided), must complete “Teach the Teacher” training before arrival. This training includes watching a 20-minute video and completing all necessary forms, listed below. Please use this checklist as a helpful tool to ensure that you've completed all of the necessary training, and that your field trip runs as smoothly as possible. It covers registration, preparation, arrival and procedures for the field trip itself. All teachers must watch this video tour of the Springs Preserve before bringing their students on a field trip. The video tour is split into 10 sections, and should take approximately 20 minutes to complete. Teachers must bring these signed documents with them to their school tour. Field Trip Guidelines & Acknowledgment form: This document contains information about chaperone requirements, lunches, Springs Preserve grounds, and field trip check-in procedures. Chaperone Expectation form: This document outlines our expectations for chaperones. There should be one chaperone or teacher for every 30 students. The maximum number of chaperones is one for every five students. Any additional chaperones above that ratio must pay $9.95 admission. ¿Hablas español? Llena nuestra forma en español de Expectativas para Chaperones.